The ongoing internal crisis of the Haryana Janhit Congress following the expulsion of former Haryana ministers Subhash Batra and Krishan Murti Hooda from the party further deepened today when a group of rebels of the party appointed Subhash Batra as the interim president of the HJC at a meeting held at he Myna Tourist Complex here. Three persons, including a Sub-Inspector of the Haryana police and two lecturers, were arrested on the charge of leakage of the question paper of the All-India Pre-Medical Test (PMT) conducted by the Pt Bhagwat Dayal Sharma University of Health Sciences here today. The Rohtak police has claimed to have solved the one-and-a-half-year-old double murder case of Satender and Neeraj near Jhajjar Chungi here. The police has arrested two cousins - Jasbir, a resident of Didwari village, and Sandeep, a resident of Vijay Nagar here - in this regard. The Department of Technical Education, Haryana, has debarred over 20 educational institutes of the state imparting technical education for seat allotment in the academic session 2009-10 due to non-extension of their approval by the All-India Council of Technical Education. The police today arrested five persons, including four women with 9 kg of fake gold, when they were trying to sell it to residents as the original yellow metal. Ajay Sharma, SHO (City), said all five belonged to Gujarat and were members of an inter-state gang and a map of Haryana has been recovered from their possession. Sanjiv Chaturvedi, an officer of the 2002 batch of the Indian Forest Service, who was suspended by the state government, when he tried to prevent the diversion of public funds for the setting up of herbal park on a “private land” at Gillankhera village during his posting at Fatehabad, has been conferred the Manjunath Shanmugam Integrity Award for this year. A large number of students of the United College of Education, Kaul, staged a procession and blocked traffic on the Karnal-Patiala road here yesterday. They were protesting against the college management. The Indian National Students Organisation (INSO), student wing of the Indian National Lok Dal, has condemned the Haryana government’s decision to withdraw numerous courses from various colleges in the state. The state government will spend Rs 1,000 crore on the overall development of rural areas within the next six months. This was stated by Chief Parliamentary Secretary Dharmbir Singh while addressing a press conference at the local PWD Rest House here today. The ongoing internal crisis of the Haryana Janhit Congress (BL) following the expulsion of former Haryana ministers Subhash Batra and Krishan Murti Hooda from the party further deepened today when a group of rebels of the party appointed Subhash Batra as the interim president of the HJC at a meeting held at he Myna Tourist Complex here. They also decided to organise a state-level workers’ conference of the party on July 12 in Jind. The conference will not only ratify the ‘expulsion’ of Kuldeep Bishnoi from the HJC but conduct elections for the party president. Giving the information at a press conference here after the meeting, Krishan Murti Hooda said a nine-member-committee under the chairmanship of the interim president had been constituted to ponder over the possibility of an alliance with any political party for forthcoming assembly election due in February 2010. Besides him, Om Prakash Jain, Balwant Dalamwal, ID Kaushik, Anand Hooda, Taiyab Hussain and Ramraj Sharma will be other members of the committee, Krishan Murti added. “The workers meeting of the party will be organised at every district headquarters to give them invitation for the state-level conference and to mobilise them. They will also stand against the ‘unethical’ action of Kuldeep Bishnoi expelling senior leaders from the party without following ‘democratic norms’, he asserted, adding that Bishnoi was not serious towards the party as he was abroad at a time when there were talks of early elections to the state assembly. He maintained that new state officer-bearers, district presidents and chiefs of various cells of the party would also be appointed during the Jind conference. Subash Batra said Kuldeep Bishnoi should have resigned from the party owning moral responsibility for the party’s defeat but contrary to this he expelled those senior leaders ‘unconstitutionally’ who not only contested the recently concluded parliamentary elections on the party tickets but also toiled hard to muster people support during the election campaign. Answering a question he said former Chief Minister and MP Bhajan Lal would also be invited for the workers’ conference. Subhash Batra and Krishan Murti Hooda were expelled from the primary membership of the HJC by the party leadership on June 9 for anti-party activities. Three persons, including a Sub-Inspector of the Haryana police and two lecturers, were arrested on the charge of leakage of the question paper of the All-India Pre-Medical Test (PMT) conducted by the Pt Bhagwat Dayal Sharma University of Health Sciences here today. Five youths, who were taking the examination in the name of other candidates, were also arrested. The accused have been identified as SI Wazir Redhu, posted at the local Urban Estate police station, and Surender Kumar and Anil Dhankar, both lecturers in Jat College, here, on the complaint of Dr Ranbir Singh Dahiya, controller of examination of the university. According to the police, SI’s daughter Monika was appearing in the examination at Jat College here. The SI with the help of Surender, who was on duty as an invigilator at the centre, reportedly succeeded in getting the question paper of his daughter leaked. The matter came to light when the superintendent of the centre started checking the question papers. The incident was reported to the university officials, who later informed the police. The police arrested the trio after making preliminary investigations. Later, a case was registered against them. The Rohtak police has claimed to have solved the one-and-a-half-year-old double murder case of Satender and Neeraj near Jhajjar Chungi here. The police has arrested two cousins - Jasbir, a resident of Didwari village, and Sandeep, a resident of Vijay Nagar here - in this regard. They have confessed to have committed the murders on December 8, 2007, along with two other associates, including their another cousin, Anil, as both of whom had been putting a lot of pressure on Jasbir for not deposing in the court as the prime witness in his father, Jagdish’s, murder case. The bodies of Satender and Neeraj were also set afire with an intention to wipe out the evidence. Jagdish was an ASI with the Haryana police and was murdered three years ago when he was posted at the local bus stand police post. SSP Alok Mittal said country-made pistols had been recovered from the possession of the accused. The Department of Technical Education, Haryana, has debarred over 20 educational institutes of the state imparting technical education for seat allotment in the academic session 2009-10 due to non-extension of their approval by the All-India Council of Technical Education (AICTE). The department has published the names of these institutes on its official website www.techeduhry.nic.in and has made it clear that these institutions will not be considered for admissions for the current academic session, the counselling process of which has already begun. Additional Director of the department DK Gupta confirmed that 26 institutes listed on the official website of the department would not be considered for admissions in the counselling process that began earlier this month as extension of approval in respect of these institutes was still pending with the AICTE. The Bhagwan Mahavir Institute of Engineering and Technology, Sonepat, Bhagwan Parshuram College of Engineering, Gohana (Sonepat), Dronacharya College of Engineering, Khaintawas (Gurgaon), Haryana Institute of Technology, Bahadurgarh, Manav Rachna College of Engineering, Faridabad, Sat Priya Institute of Engineering and Technology, Rohtak, NC College of Engineering for Women, Balana (Panipat), and the Swami Devi Dayal Institute of Engineering for Girls, Golpura (Panchkula), are the institutes offering BTech that have been denied admissions by the department this year. The Budha College of Management, Rambha (Karnal), Sat Priya Institute of Management Studies and Research, Rohtak, Guru Har Krishan Institute of Management and Technology, Raitkhana (Karnal), Lakshay Institute of Management Studies, Naultha (Panipat), SJS International Institute of Management, Samalkha (Panipat), Seth Banarasi Dass Institute of Management and Technology, Kurukshetra, DAV College of Management, Hassangarh (Rohtak), Haryana Institute of Technology, Bahadurgarh, Manav Rachna College of Engineering, Faridabad and the Bhagwan Mahavir Institute of Engineering and Technology, Sonepat, are the colleges offering MBA that have failed to get extension of approval from the AICTE. Among the institutes providing MCA degrees that have been not considered for admissions this year are the BS Anangpuria Institute of Technology and Management, Alampur (Faridabad), Guru Nanak Khalsa Institute of Technology and Management, Yamunanagar, MR DAV Institute of Management Studies, Rohtak, Manav Rachna College of Engineering, Faridabad, and the Sat Priya Institute of Engineering and Technology, Rohtak, while those providing B Pharmacy degree are the Royal College of Pharmacy, Sarsod (Hisar), Shree Ram Institute of Pharmacy, Urjani (Yamunanagar), and the Janata College of Pharmacy, Butana (Sonepat). The first counselling for admissions to all technical colleges of Haryana is in progress and will end on June 18. “These institutes will, however, become eligible for being considered for admissions the moment they get approval from the AICTE,” said Gupta. The police today arrested five persons, including four women with 9 kg of fake gold, when they were trying to sell it to residents as the original yellow metal. Ajay Sharma, SHO (City), said all five belonged to Gujarat and were members of an inter-state gang and a map of Haryana has been recovered from their possession. The accused have been identified as Kishori, Jamuna, Radha, Kashmi and Kallu and have been sent to judicial custody by the Duty Magistrate before whom they were produced by the police. Sharma said on receiving a tip off, a team was constituted under Sub-inspector Balbir Singh, who called the accused to the railway station by sending a decoy customer. The officer was suspended by the government in August 2007 and later reinstated by a presidential order in January 2008, when the government failed to produce any documentary evidence in support of the suspension order. The park has since come up in Gillankhera and the matter, including the fact of ownership of land, is pending before the Supreme Court. 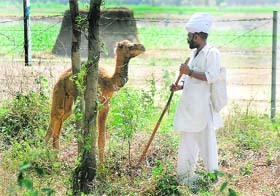 Earlier, Chaturvedi had taken a stand against cutting off of trees from the Saraswati Wildlife Sanctuary to make way for heavy trucks for the construction of a canal during his posting in Kurukshetra district in 2006. Considering the sense of integrity exhibited by Chaturvedi in the face of strong pressures, the Manunath Shanmugam Trust selected Chaturvedi along with two others for the third Manjunath Shanmugham Integrity Award, instituted by IIM alumni in memory of IIM alumnus and Indian Oil Corporation officer Manjunath who was killed in UP on November 19, 2005, while trying to stop a fuel adulteration mafia. The awards were given yesterday at Bangalore. Interestingly, while the officer’s services have been recognised by others, the state government is still to cancel the chargesheet against him though he has long been reinstated and is at present posted at Jhajjar. The students resorted to agitation after they came to know through a news report that Kurukshetra University has disaffiliated the college following receipts that the college management had given admission to 200 students against a sanction of 100 in the BEd course during the current academic session. The students blocked the road by placing stones in the middle of the road. The traffic remained disrupted for a few hours. The naib tehsildar and the police asked the students to withdraw their protest promising that they would inform the higher authorities about their grievances. After persistent persuasion by authorities, the students withdrew the blockade. The students alleged that the management had kept them in dark and they would have to suffer a huge financial loss and their one precious year would be lost. They were demanding registration of a case against the office-bearers of the college management and refund of their admission fee other charges and compensation in lieu of loss suffered by them due to the acts of the management. Parents of some students also reached the college and criticised the management for its anti-student attitude and demanded action against the management. However, it could not be ascertained that whether the university had disaffiliated the college or not. The college authorities could not be contacted to know the actual position. The students had been agitating for the past many days after getting information that only 100 students would be allotted roll numbers for the coming examinations. In a press note issued here today, INSO Haryana unit president Vikas Rathee described the decision as reflective of the “anti-education and anti student attitude” of the Congress government in the state. He said the government’s decision to withdraw the most basic courses of BA and MA from various colleges did not carry any logic as lots of students preferred to go for these courses. Rathee said the government should have introduced new courses for the welfare of the student community but it was scraping the already existing courses. He said BA was the most basic and multi-faceted course and economical too for all section of the society, who could not afford expensive courses and the government had done away with such courses, which also made a student eligible for entering the highest service in our country, the IAS. He said the government’s decision to scrap both courses of BSc, medical and non-medical from various colleges showed that it had no concern for the poor students, who had no other option than to study science courses in government colleges as private colleges charged heavy fees for the same courses. He said when central universities like Delhi University were providing these courses then how could the state government behave in such an indifferent manner. The state government will spend Rs 1,000 crore on the overall development of rural areas within the next six months. This was stated by Chief Parliamentary Secretary Dharmbir Singh while addressing a press conference at the local PWD Rest House here today. He said no previous government gave as much attention towards the development of rural areas as the present Congress government had given and this development was being done to the tune of urban areas. Besides rural development, projects worth crores were being prepared for the development of other areas, he said. He said 10 new drains were being constructed in the western Haryana. When asked about the shortage of power in the state, he said work on new power projects of Khedar, Jhadli and Yamunanagar was on war footing. He said people of the state had voted for the Congress in the recent Lok Sabha elections just on the basis of development. To improve sewerage system in Bhiwani and Charkhi Dadri, the state government had finalised a project costing Rs 150 crore.